Discussions began in early November 2007. Kiwanis Club of USJ officially adopted MRDS for a year effective October 2007 whereby they will help organize activities for MRDS. Their first project with MRDS : a fund-raising drive through the printing and sale of 2,000 memo pads at RM10 each with 80% of the net sales amount to be donated to MRDS. Kiwanis is a global organization of volunteers changing one child and one community at a time. Kiwaniars achieves what an individual cannot achieve alone. The Kiwanis Club of USJ was established in 2003 with 20 members living and working around the community. There are 48 clubs with 1300 members throughout the country. Kiwanis USJ is part of this big organization. Children are our priority and that’s number one. 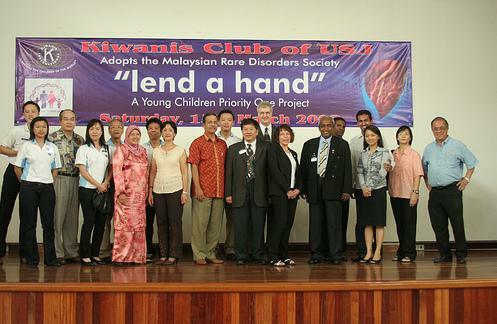 with this in mind the Kiwanis club of USJ adopted the Malaysian Rare Disorders Society (MRDS), a non-profit organization to reach out to these children. In view of this rising need, the Malaysian Rare Disorders Society (MRDS), a non-profit organization was formed in 2004. one of the main goals is to create a support network and act as an avenue for information for individuals and families affected by rare disorders. The society aims to speak with one voice on the needs of the people affected with rare disorders and to collaborate with organizations that have the potentials to improve the quality of life for these individuals and their families.